Blanc de Chine (lit. "white of China") refers to a white ware that was produced for centuries in the town of Dehua in the coastal province of Fujian. 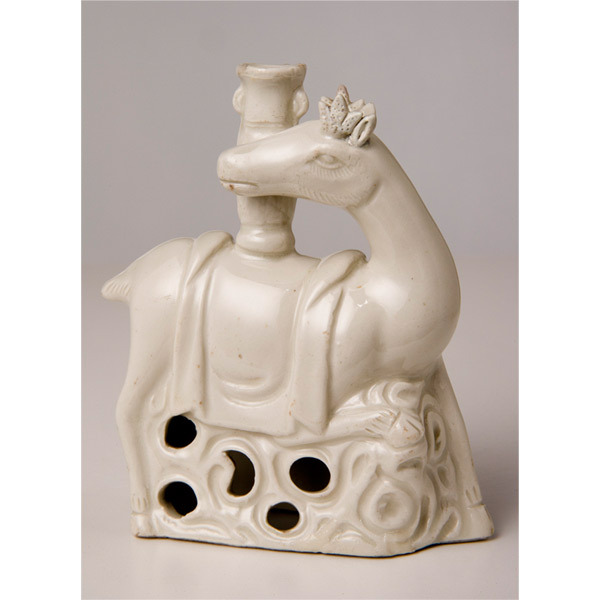 The sugary white clay of the Dehua area is made from a porcelain stone that is unusually low in iron impurities and fuses with the applied transparent glaze during the firing, producing works of a glossy, smooth quality that resembles ivory or white jade. Extremely resistant to the distortion that can be caused by high-temperature firing, the clay is ideally suited for the production of thickly potted, press-molded and/or sculpted vessels and figurines for the scholar's table or family altar. 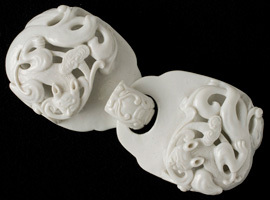 Many such functional and decorative works are finely detailed or embellished with applied relief decoration, such as blossoms or dragons. Porcelain production began in Dehua as early as the Song dynasty (960-1279) and flourished from the sixteenth to the eighteenth century. At first widely exported to Southeast Asia and Japan, blanc de Chine soon also found a market among European royalty and aristocrats when it was imported by various European trading companies. Western interest in blanc de Chine gradually waned as Europeans discovered the secrets of porcelain manufacture. 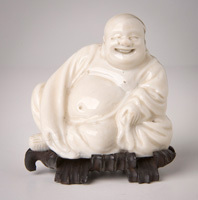 Dehua kilns have continued to produce white ware figures into the modern age; these late versions are usually slip-cast.